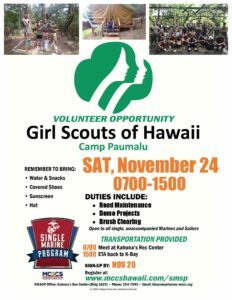 SM&SP Volunteer Opportunity with the Girl Scouts of Hawaii. Assist with various construction projects at Camp Pamalu. Transportation provided. Meet at Kahuna’s Rec Center at 0700. Visit www.mccshawaii.com/smsp to register.